Can Your Electronics Survive a Flood? Water and electronics just do not get along well. 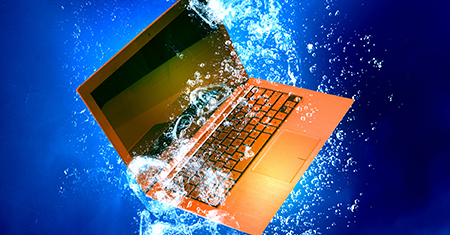 Water exposure can cause serious damage to electronic devices to the point where they are may be irreparable. Whether your devices were dripped on or submerged by a flood, they are likely to be damaged and malfunctioning while still wet. Pure water isn’t really the culprit here, but the minerals in the water that form crusty salts on the internal components. •A change of color on the LCI (Liquid contact indicator), which is often on the inside of the device. Before throwing all of your equipment in the trash, take these steps to try restoring it yourself. Be sure to do this even if the item is still working while wet because corrosion is probably still in the process. Remove all the water you can. If you follow these steps as soon as possible and within 48 hours of exposure, you will have a chance to restore your items. Your best bet, especially for uninsured or out of warranty items, would be to call a professional restoration company for help. We have access to the tools and knowledge that will be most likely to get you up and running again.